This magical Southeast Asia river cruise along the Mekong River will take you through Vietnam and Cambodia, showing you the culture and local traditions of each country and the must-see sites along the way. Your adventure begins in bustling Ho Chi Minh City, Vietnam, where you’ll get a taste of the culture first-hand with a Vietnamese cooking class and go on a fascinating excursion to the Cu Chi Tunnels, an extraordinary network of tunnels used extensively during the war. Immerse yourself in the everyday life of locals with a stroll through a busy market, and visits to a family’s home for a cotton-weaving demonstration and a local workshop to see how rice wine and traditional candies are made. Continue your journey into Cambodia where you’ll visit the famous sites, such as the temple of Wat Hanchey, providing spectacular views, and take part in a traditional water blessing with local monks. Enjoy an ox cart ride around the Cambodian countryside and meet a local farmer to learn about his daily life. Siem Reap offers the magnificent Temples of Angkor, ancient ruins that are a display of architectural complexity and grandeur unlike anything else in the world. See the most famous temples here, such as Angkor Wat and the Bayon temple, which features some 200 mysterious faces carved in its many towers. Enjoy an inspiring Aspara dance performance and other treasures of the city. 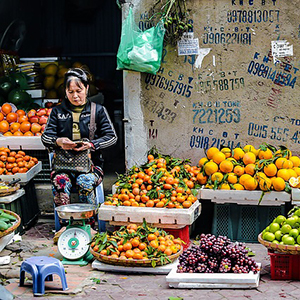 Fly to Hanoi and explore the famous sites, such as the Old Quarter, where peddlers have traded goods for centuries on its 36 ancient streets. Next, a remarkable 2-night cruise along Ha Long Bay will show you its beautiful Limestone Islands. Next, sightseeing in Hue, a former capital of Vietnam, will show you the imposing Imperial Citadel; Thien Mu Pagoda, the unofficial symbol of the city; and the Royal tombs of past emperors. Arrive in Danang, known for its beautiful beaches and culinary scene. Visit the Cham Museum and explore Hoi An Ancient Town, a UNESCO World Heritage Site, where architecture influenced by traders from around the world has been largely preserved. You’ll have free time to explore the area or perhaps relax at your beach resort. The perfect ending to an unforgettable Southeast Asia river cruise vacation! The all-suite Avalon SaigonSM, our newest Suite Ship® in Asia, was specifically designed to offer the best cruise experience on the Mekong River. 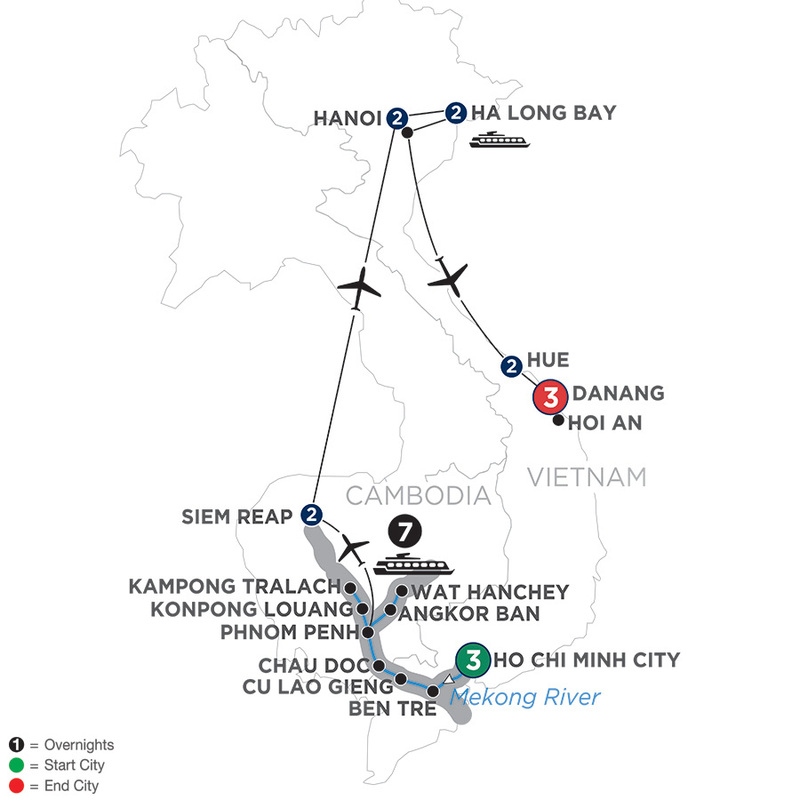 She is one of only two ships in the industry, along with her sister ship the Avalon Siem ReapSM, cruising from Ho Chi Minh City to Siem Reap* (or vice versa) eliminating hours of motorcoach travel time, which means you enjoy more cruising! The ship has been meticulously crafted to offer all the modern features you expect, yet it retains the colonial charm fitting to Vietnam and Cambodia. While the number of guests on the ship may be small, the ship isn't. Built as long and wide as other ships that carry twice as many guests, the public spaces never feel congested. From the air-conditioned Panorama Lounge to the open-air observation lounge, there is plenty of seating and spots to relax. Plus, our lounges are located at the front of the ship, not the back, so no matter where you sit you'll always have a great view. From the reception staff and bartender to wait staff and room attendant, we always deliver exquisite service that's comfortable and friendly - never stuffy! With Avalon, our ship becomes your home away from home. *Cruising to Siem Reap is dependent on water levels. If you want to see the world, cruise down its legendary rivers. If you want to see more of the world, look no further than Avalon Waterways. Our Suite Ships feature one-of-a-kind Panorama Suites, with the widest opening windows in river cruising, the industry’s only Open-Air BalconySM, and beds facing the incredible views. Beyond our wall-to-wall, floor-to-ceiling windows is a world waiting to be explored—your way. Whether you want to enjoy a guided walking tour of one of Europe's great cities, join a cooking class or paddle a canoe, our Avalon Choice® selections of Classic, Discovery and Active excursions offer a wide range of possibilities. When you prefer to explore on your own, we can help you with all the recommendations, information and gear you need with our new Adventure Center and AvalonGO Mobile App. And when it's time to refuel, your dining options on board are as wide open as your views, with our new FlexDining® choices. Don't see what you want? Call us.